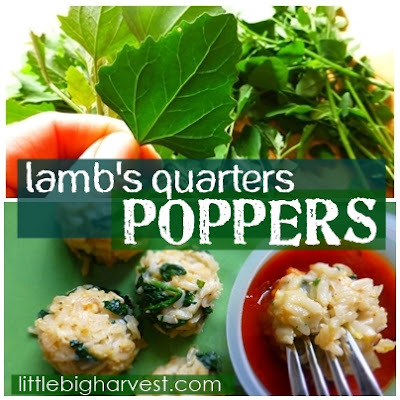 I'll never forget how excited I was to discover Lamb's Quarters. Discovering that a 'weed' is edible is always a thrill! Other names for this tender and delicious plant: goosefoot, fat hen, and smooth pigweed. Most people consider it an invasive weed, but once I found some for myself and had a taste, I was glad to have it in my garden. 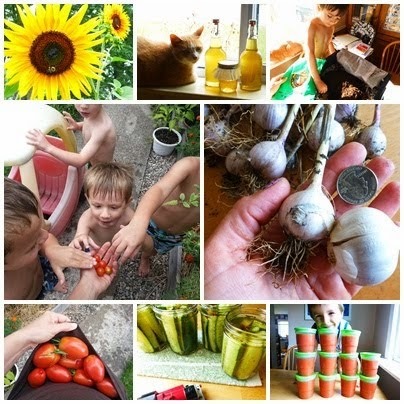 Click here to see why this 'weed' is a treasure! While I recommend keeping it in check--because it can be very invasive--I am here to tell you to enjoy this tasty and nutritious green. It's one of the first harvests of the year for me, because here in zone 6 it shows up around mid-March and can start being eaten by April. 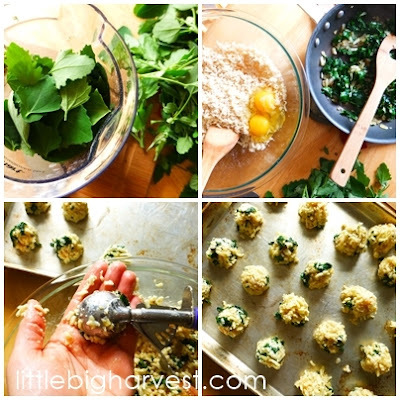 Fresh greens that are free, easy and tasty--sounds great to me! 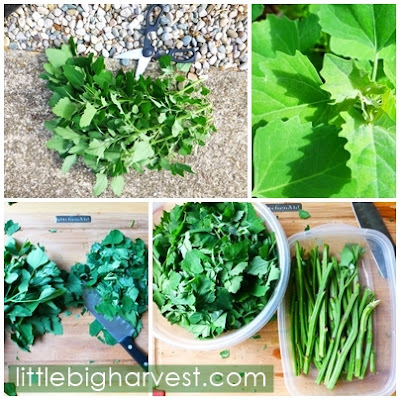 If you can't eat your harvest right away: Chop up the leaves and small stems, removing the largest stem pieces. The large pieces taste like asparagus to me and are great for a crunchy snack, but in my experience don't cook well. You can store the chopped lamb's quarters in the fridge for a few days. Use them up in salads, eggs or frittatas, cooked into rice or quinoa, in a hummus melt, or in the recipe below for poppers! (this simple pizza sauce is our favorite). I have to fight to get a share once the poppers hit the table. I've been making versions of this recipe for years, usually with spinach. Lamb's quarters is the perfect substitute, especially if you find yourself lacking spinach. Try using a couple cup-fulls of both if you want. 2. Saute onion and garlic in the oil over medium heat until softened, about 5 minutes. Add lamb's quarters (or spinach, or a combination of both) and cook until wilted. Lamb's quarters cooks a little differently than other greens--it tends to stick together and dry out. If needed, add up to 1/4 c. water, a tablespoon at a time, to prevent too much drying out. Remove from heat and let cool slightly. 3. Mix the rice, cheeses, spices and eggs in a large mixing bowl. I have made this with long-grain rice a few times, and once it bakes, the poppers hold together fine--however making the balls is tricky because long-grain rice doesn't have a lot of starch to help it stick. I recommend using medium or short grain rice because it naturally sticks together much better. This brand (affiliate) has everything I want--short grain, brown, and organic. I can find it at most of my local grocery stores. 4. Add cooked onions/greens mix to the bowl and stir to combine thoroughly. Form into golf-ball sized balls (I use this cookie scoop ) and place on an oiled baking sheet. You can really crowd them together so they all fit on one sheet. 5. Bake for 20 minutes, or until browned to your liking. The bottoms of the poppers will be crispy and golden brown. Use a thin metal spatula to remove the poppers (if you don't have one, you may want to use parchment paper instead). 6. Enjoy! Be careful--they are highly addictive.